Fibonacci numbers were, I think, my first formal introduction to the idea that math and science are essential to the beauty of the natural world. I was in early elementary school when I learned about this sequence via the golden ratio, and although I was more the type of girl who wanted to blend colors in the ice cube trays in the corner of the room than learn about fractions or practice kid-friendly science experiments, even then I understood that there were rules to the magnificence of both art and nature. For example, if I mixed the wrong colors, the result would be some terrible garbage-like hue. So, with trees in mind, I learned that blue and yellow make green; thinking of the sun, I found that red with yellow results in orange. So on and so forth. While it does not seem that Madhur Anand’s A New Index For Predicting Catastrophes was written in a vein of any sort of didacticism, it certainly seems conscious of its own educational elements. Anand, who holds a Ph.D. in theoretical ecology, titles many of her poems by scientific names such as “Cantharellus” and “Cosmos bipinnatus,” terms which I most certainly had to deduce or, more frequently, look up. Somewhat like research scientist Katherine Larson’s poetry in Radial Symmetry, another contemporary collection doing the important work of bridging the gap between our understanding of science and art, Anand’s New Index uncovers beauty through science. While Larson, however, often writes of dissection, and although both books contain observations and moments of discovery, Anand’s collection seems to be more of a field guide. Of inhaled air that does not take part in gas exchange. Benefits can accrue. For example, inflation. …and much more. In fact, some of Anand’s poems, such as “The Strategy Of The Majority” are composed only of phrases found within single scientific articles, which are noted at the bottoms of those pages. The majority of the poems in this book are written in 13-syllable lines. Of the three naturally occurring forms of carbon, only those with atomic mass 12 and 13 are stable, and they occur in a proportion of 99:1, respectively, in the natural world. And so I think back to my elementary-school lessons and beyond about the rules of math and science and art and nature, and how they are all, most likely, interconnected in ways that we’ll never fully understand. Perhaps the mysteries are what draw us to nature, what render us fascinated. 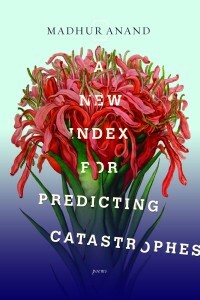 Madhur Anand’s A New Index For Predicting Catastrophes, however, is a gentle yet exquisite reminder that exploring what we do not understand is at least as powerful and at least as important.